But anyway, here's our interview with Ruth. 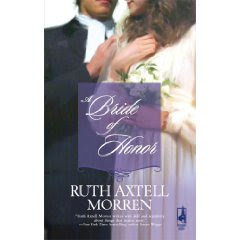 Don't forget she's giving away a copy of A Bride of Honor, so be sure to leave a comment! Ruth, which book (published or upcoming) has been the most fun for you to write and which character is your favorite? Why? It’s funny—excuse the pun—but “fun” wouldn’t be a word I’d use to describe my books or writing process—more like emotionally moving, because when I write, I usually get so involved in my characters, and their story, after all, is an emotional journey. But as to funny, it would have to be The Making of a Gentleman. This Pygmalion in reverse story had lots of funny moments because the hero, a pig-headed, uneducated man, with his share of charm, was pitted against a spinster with very little tolerance for his charm. I think I was inspired in part by Katherine Hepburn and Humphrey Bogart in The African Queen. I love how you weave faith into your books. What are some of the spiritual themes you like to write about? Well, definitely, and probably foremost, is the them of a person’s journey to Christ, but I’ve also written about forgiveness and unfaithfulness (Dawn in my Heart); healing, both emotional and physical (The Healing Season); consecration (Lilac Spring). Often, too, the theme of coming to understand God’s love for us—and through this, being able to love and accept ourselves, is woven through my stories. You've lived in different places throughout your life. Which place has been your favorite? What is it about that place that makes it your favorite? Boy, you ask hard questions! Ever since really coming to Christ, I’ve been pretty content anywhere I’ve lived. Right now, I’ve moved back to coastal Maine, and despite its long and cold winters, I have to say I love it. The scenery is breathtaking and definitely inspiring to my writing. Last spring my daughter and I revisited Paris, which I hadn’t been to since my young twenties, and it was as lovely as always. There is probably no city like Paris. It was May and there were tons of American college kids walking around, and they reminded me so much of my own junior year in Paris. My childhood was spent in Rockport, Maine, and my memories of those days are full of trees and stone walls and fishing and the ocean and blueberries and crunchy apples. What are some of the things you love about Maine? The rocky coast, the intensity of the blue (like a midnight blue) of the ocean and the blue of the sky (cerulean maybe?). The smell of balsam fir. One winter we made Christmas wreaths for sale in our basement, and the aroma was heavenly! Of course, blueberries are great and those super tangy apples from gnarled trees that are about 100 years old. They make great applesauce and pie. What is the quirkiest (or most fun) thing you have ever done? My latest part-time job is making me do some quirky things. I’m working for the 2010 Census. It’s taking me to all kinds of places off-the-beaten track here in downeast Maine. Walking down rutted roads, because I’m afraid my car won’t make it back out, hoping I won’t run into a bear or coyote, just to see if there is a camp or other human dwelling down there, is one of the things. I think we all weave emotions we’ve experienced into our characters. That’s the only way to make them sound authentic. Their situations may be different, but the emotions are the same. Last year was a year of transitions for me, and for the first time since I’d seriously begun to write (about 20 years now), I had lost the joy of it. I didn’t feel inspired, and for a while, I even thought maybe this was it. The Lord had allowed me to experience being a published writer, and now it was time to move on to something else. And then, one night it hit me: the problem was trying to write to an editor’s or a publishing house’s expectations. I needed to come back and write what was on my heart, regardless of how marketable it was. It has made all the difference in writing. A friend of mine recently commented with a mixture of envy and awe that I seemed to manage my time so well. I didn’t really know what to say, b/c I’ve never considered myself a super organized person. I know a lot of people I consider more organized. But as I thought about it, I realized the key for me was having a goal. One of my favorite Scriptures—especially during those long years of being an unpublished writer—is the one of running with patience the race that is set before us; that in due season we shall reap if we faint not. I told my friend afterwards that by having a goal or goals, it helps get me through all the other STUFF I have to deal with. Seeing a book in print, or reading a moving e-mail from a reader, or getting a great review makes all those hours sitting at a computer writing a story, then re-writing it; enduring editorial revisions ; proofing, etc., etc. all worthwhile. So, keeping my eye on the end goal helps me keep on keeping on with the daily slog. What is something the Lord teaching you right now? Once again, it’s a question of trust. Trusting in Him for my teenagers, trusting in Him financially, trusting in Him for my health, trusting in Him for my next writing contract—I mean REALLY trusting Him. Not just praying to Him, comforting myself with a few Scriptures, and then turning around and worrying or fretting when things aren’t seemingly going my way. Do you have any upcoming books? Can you tell us about your next book out? 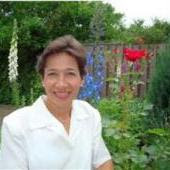 The best way is through my blog, http://ruthaxtellmorren.blogspot.com since I don’t always have my website up to date. I’ll always post my latest bookcover on my blog. Don't forget to leave a comment to be entered in the book giveaway! The drawing will be open until Saturday evening and the winner will be posted on Sunday. Coming up next week is Jenny B. Jones. I'm adding Ruth to my to read list! I enjoyed this interview a lot, and gained insight from it regarding my own "writer's journey." I will also have to check into her writing, I'm sure she writes good stuff. Thanks for sharing! Thank you for this insight. It is interesting to read how Ruth talked about trusting in the Lord as appose to fretting. I hope that sticks with me. I believe that is my biggest weakness, I say I trust Him, but I get all caught up in the "what if" drama. A little encouragment she probably didn't even realize she was giving! Thanks for that! Very good interview! Good thoughts to ponder.